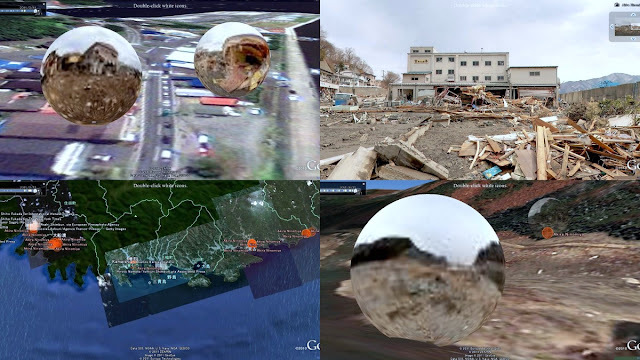 "The East Japan Earthquake Archive" is a pluralistic digital archive for visualizing and telling the real state of the damage situation of the East Japan Earthquake using a digital earth. 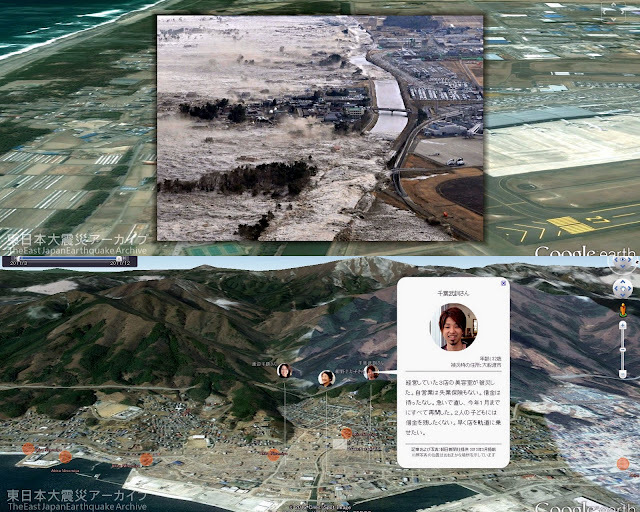 Since data such as photographs, panorama pictures and disaster victims' testimonies are unified on Google Earth, users can browse all the data in bird's-eye view. Furthermore, the time stamp function is mounted in this archive. Users can also browse all the data along with the time progress after the occurrence of The Earthquake disaster. The layer of "tweets with geotags" can be browsed. This layer includes geo-tweets of 24 hours from Mar.11 14:46 (the occurrence time of the earthquake ). The data of this layer is random sampling of one third of tweets from the result of "the listing project of the tweet with geo information" as a part of "The big data workshop of The East Japan Earthquake". "eARthquake 311" is an iPhone AR Apps version of a pluralistic digital archive - “The East Japan Earthquake Archive”. Download for free. For iPhone / iPad. The Map Mode that displays data by using Maps. Data are displayed by touching markers. 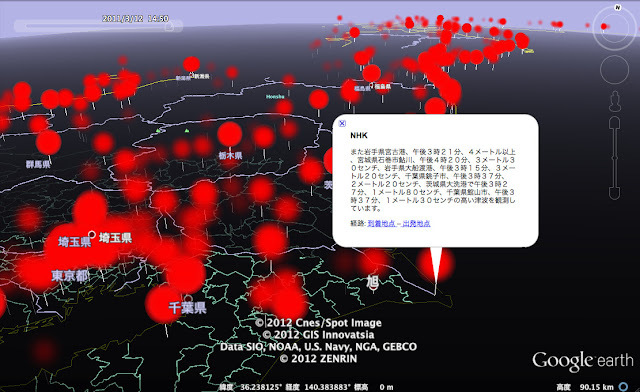 And more, in Japan, Users can know the situation caused by The East Japan Earthquake in March 11, 2011 using a GPS function. By using "The AR (Augmented Reality) mode", Data can be displayed by AR overlapping with actual cityscape. The user can know the distance between stricken areas and current location. "eARthquake 311" has a function of Twitter. The hashtag "#japan311" is attached to user's tweets. Communication between users is urged by this function. #These texts are quoted from "Connecting the last mile - The role of communications in The Great East Japan Earthquake" by "Internews". The Great East Japan Big Data Workshop - Project 311 is a major post-disaster initiative designed to help improve preparedness for future natural disasters through technology. The main focus of the project is to share data sets owned by leading organisations including Google, Twitter Japan, NHK, Asahi Shimbun, Honda, and the mapping company Zenrin. We joined this workshop and made 2 mash-up contents. "Project Hayano" aims to understand the risk of thyroid cancer among children in Fukushima and nearby areas through data visualization and simulation. By combining different data sets provided by the 311 Project and other released data from SPEEDI, JAMSTEC, and so on, Professor Ryugo Hayano from Tokyo University aims to establish the foundation of a legally sound evidence base if cases of thyroid cancer arise in the future. We took charge of mash-up creation and data visualization in "Project Hayano". Please refer a detailed blog entry about Project Hayano by Fumi Yamazaki (Google Japan). Another project that came out from this workshop was "Mass Media Coverage Map" that was developed by us. 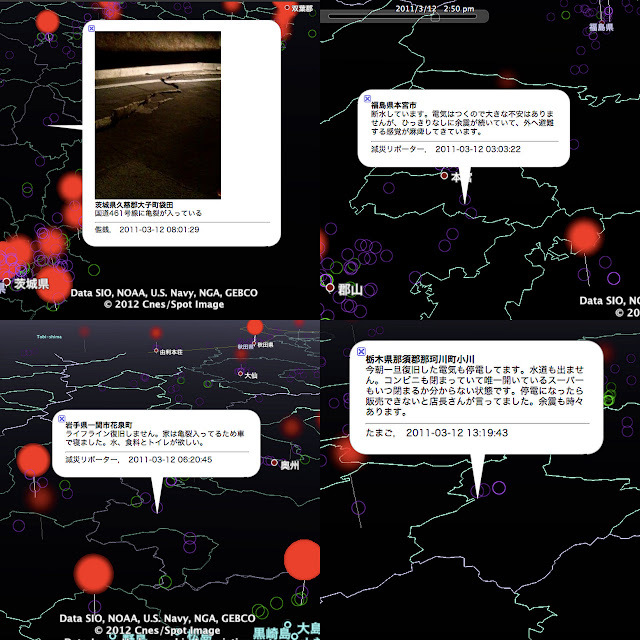 This project mapped out mainstream media’s data including NHK’s breaking news coverage scripts and crowdsourced data such as geo-tagged tweets and crowd information gathered by the WeatherNews’ Gensai Report.Evidence suggests that there were a number of areas that had only limited stories broadcast about their communities. A review of geo-located tweets and crowd-sourced information showed that social media and user-generated content appeared to be a primary source of information in these areas. Please refer a detailed news article about Mass Media Coverage Map by Emergency Journalism. The traffic results information of the area of devastation of the Japan Earthquake (daily update) by HONDA and TOYOTA are overlapped with other geographical data. Available roads and other information are overlapped, so users can understand the real situation of the area of devastation easily. Layers can be switching with check boxes, and also, Google Street View is available. Please wait for a while until contents are displayed because the data size is large. Researchers of "Project 311 - The big data workshop of The East Japan Earthquake".